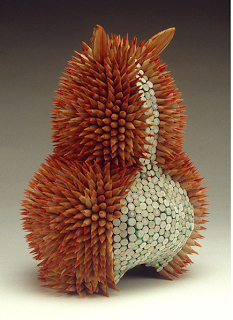 living in Massachusetts, with an art degree. she got fascinated by the sea urchins, and worked with that concept he last year in college. the idea of something beautiful but that you would be dissuaded to touch it is the concept she likes to work with. 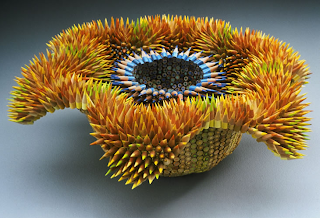 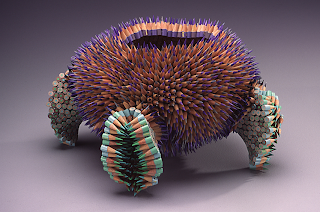 utilizing pencils, and a stitching technique called peyote stitch(usually used in beading) she is able to create this intricate colorful sculptures, that even thought are colorful and inviting, you won't want to touch. the complexity of her forms and the fact that she is using color pencils is so unique and beautiful.